I found this super cute skirt pattern here. 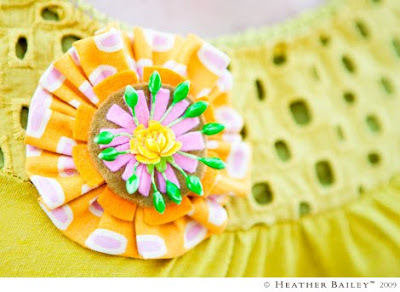 I love the ruffle detail, the flower applique and the wool jersey fabric it is made out of. I think I will use this flower as inspiration for the flowers on this skirt. The instructions can be found on Heather Bailey's website here.